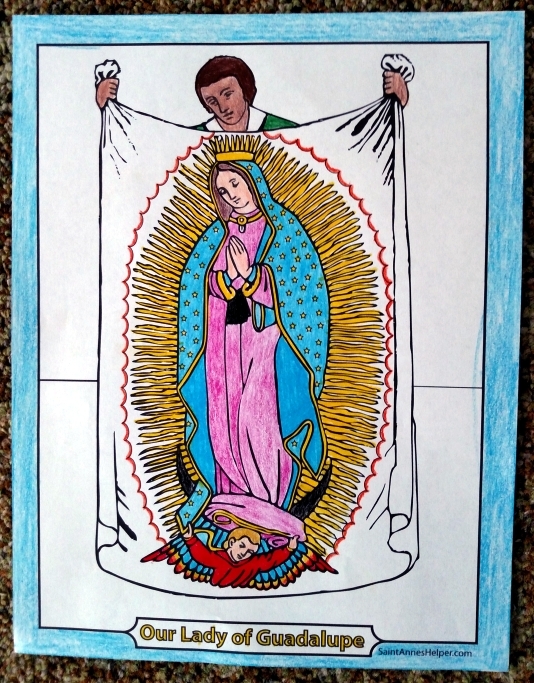 Color Our Lady of Guadalupe coloring page, December 12. Happy feast day! 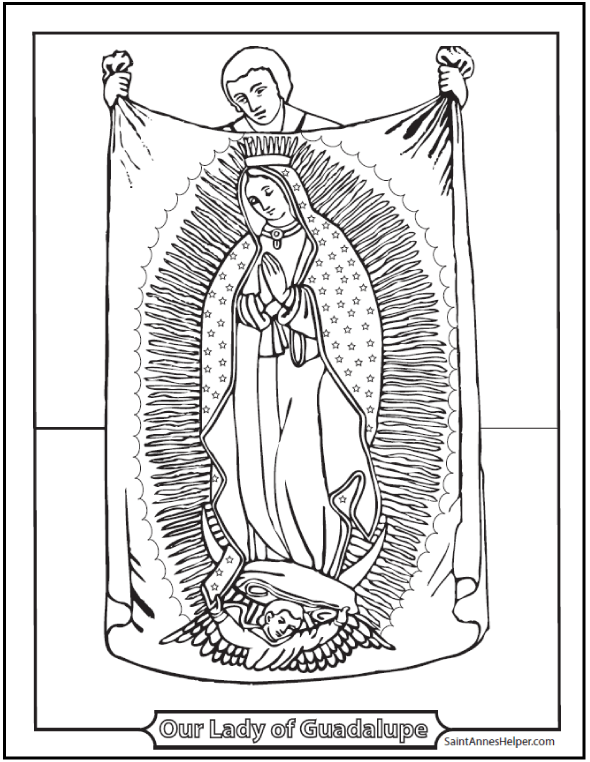 Celebrate Mary's feast December 12 with an Our Lady of Guadalupe coloring page. This has Juan Diego showing his tilma and it is based on an antique design. Our Lady is patroness of the Americas and is special to Mexico as that is where she appeared to Juan. PDF prints 8.5x11" single sided. 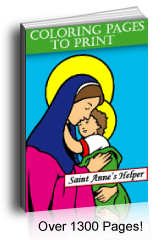 Click to print Juan Diego's tilma showing Our Lady of Guadalupe. Juan Diego's Tilma With the Miraculous Image. Remember that several of the symbols in this picture are important to her message, even the colors on her robes. Her sash under her hands is black, a sign to the Indians that she was expecting Jesus. The Wonder of Guadalupe is a beautiful book that tells the history of the Spanish Conquest of Mexico and how the Catholics converted the Aztecs with the help of Our Lady's apparition in 1531. It proves that the picture on the tilma is not a painting. It is a miracle that it survives as a proof of her love for us. You can still visit the tilma in Mexico City today. A Handbook On Guadalupe was highly recommended by Benedictine monks that tells the history of the miraculous tilma, gives a description of the symbols on the image, and even the pictures in her eyes that reflect the people in the room at the time of the miracle. 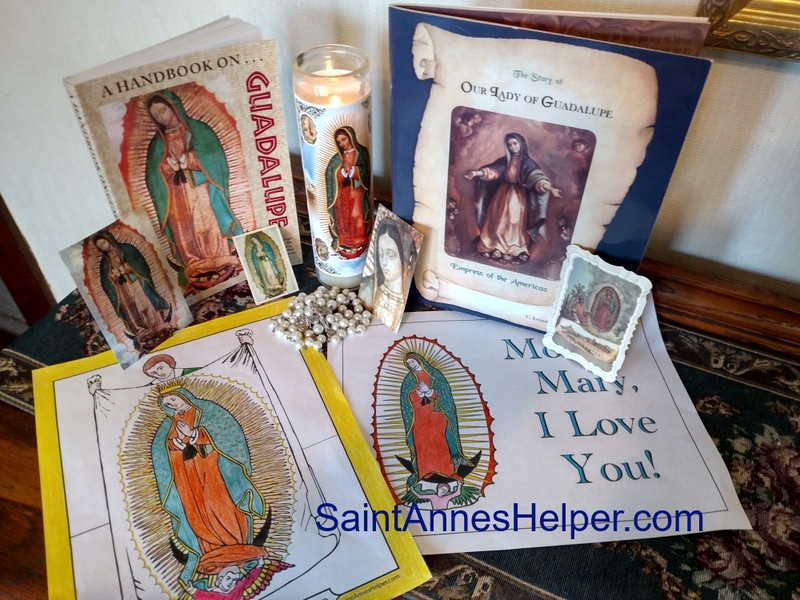 See more Guadalupe rosaries, pictures, books, and medals at Aquinas and More. La Virgen de la Guadalupe is her title in Spanish and she is patroness of the Americas, especially Mexico. She is also your patroness if you go to Our Lady of Guadalupe school, Catholic Church, or festival. We love to see the many organizations dedicated to her like Our Lady of Guadalupe Chapel and Monastery away in the hills in New Mexico. Holy cards with Our Lady's image are lovely to give on her feast day or for all those named after her. Many will have a prayer on the back side and here are several Guadalupe prayers to her.